In ’L’Atelier du peintre’ (the artist’s studio), the latest offering from Cirque Plume which is playing to packed houses at the moment at Odyssud, it all starts with a silent one-on-one, with ’Las Maninas’ by Velasquez showing the artist about to paint the Spanish Royal family. The actual subject of the painting is a minuscule reflection in a mirror, as if to say that the most important thing is not the subject of the painting but everything that surrounds it, to which one doesn’t usually pay much attention. It’s a very modern idea, illustrated by Lucio Fontana who slashed his black and white canvasses with a razor blade, or the followers of the Supports/Surfaces movement, some of whom made the frame an integral part of the work, painting frames without canvasses or representing the image of the frame on the canvas itself. 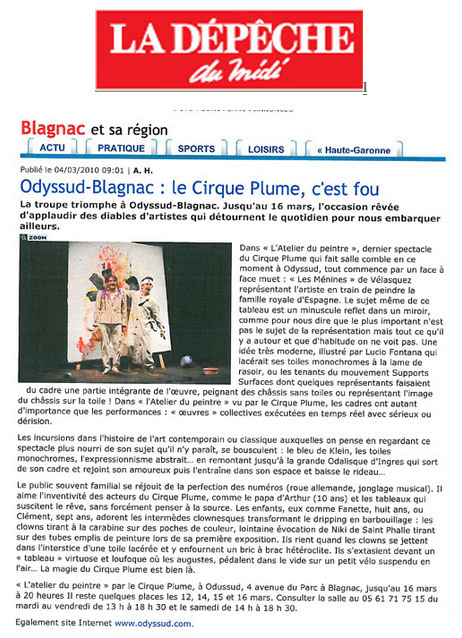 In ’l’Atelier du peintre’ as seen by Cirque Plume, the frames are just as important as the performances: ’collective ’works’ executed in real time with a serious or light-hearted approach. There are many incursions into the history of contemporary or classical art during this show, which owes more to its subject matter than it would appear: the blue of Klein, monochrome canvasses, abstract expressionism… reaching as far back as Ingres’ Odalisque, who leaves her frame and returns to her lover then pulls him into her space and the curtain falls. The audience, to a large extent made up of families, marvels at the skill of the acts (German wheel, musical juggling). It enjoys the inventiveness of the Cirque Plume performers, like the Arthur’s (age 10) father, and the dreamlike tableaux, without necessarily thinking about the ideas behind it all. The children, like Fanette, aged eight, or Clément, seven years old, love the comedy interludes when ’dripping’ (a paint technique) is transformed into scribbling, and clowns shoot rifles at pockets of colour, a reference to Niki de Saint Phalle shooting at concealed pots of paint during her first exhibition. They laugh when clowns throw themselves into a hole made in a canvas and stuff in a strange collection of bric à brac. They go into raptures over a brilliant and zany ’picture’ that has clowns pedalling in mid-air on a tiny bicycle. The magic of Cirque Plume is definitely present.